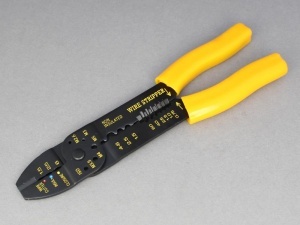 Light duty (occasional use) crimping tool for crimping of pre-insulated terminals (red, blue, yellow). Also capable of crimping many non-insulated terminals. Features a cable cutter, wire stripper and cushioned handles for comfort. No problems with it. It's hard on the hands to fully press the handles together as it's not a rachet system but for a cheap tool it does what it needs to.